Rinse the dried chickpeas several times before leaving them to soak overnight in water. They will begin to swell and expand overnight, this is normal. Drain the water again and add 6-8 cups of water to a 3 quart pan with the channa and bring to the boil before reducing to a simmer for 30 minutes, where the chickpeas will tenderise. Mix the curry powder with the coriander and 5 tablespoons of water. Add 2 tablespoons of coconut oil to a heavy duty pan on medium heat temper the cumin seeds until they release their aroma and pop. 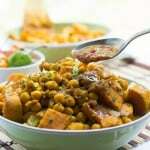 Add the chickpeas, coating them in the curry mix, do stir often to prevent sticking and burning. Now add the potatoes to the pan along and season the entire pan with salt and pepper. Pour the chickpea water over the channa and aloo enough to cover everything in the pan, how much will depend on the pan’s circumference, you shouldn’t exceed the leftover water. Bring to the boil, before reducing to a slow simmer for 20 minutes. The liquid will absorb and thicken somewhat as it simmers away. Remove the pan from the heat and set aside to cool down and thicken further before serving.